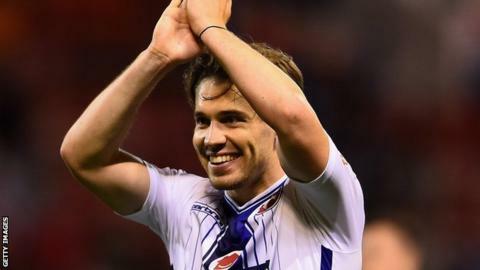 Walsall manager Dean Smith says Tom Bradshaw is not for sale, after rejecting a bid for the in-form striker from League One rivals Swindon Town. The 23-year-old, who extended his contract in June, was the Saddlers' top scorer last season and has already hit four goals in three games this term. "We don't want to sell him and he wants to stay," Smith told BBC WM 95.6. "Tom showed his intent by signing his new contract and, as far as I'm concerned, he's not for sale." The Saddlers' victory at Roots Hall was their first League One win of the new season. They did not win a league game until mid-September last term. Bradshaw, who joined Walsall from Shrewsbury Town last summer, scored his first professional hat-trick in last week's League Cup win at Nottingham Forest. And he followed that by scoring the first in Saturday's 2-0 win at Southend, as Smith's side continued their unbeaten start to the campaign. "He led the line well, had good support, and took his goal really well," the Walsall boss said. "Anyone who comes to watch us will see that it's not all about Tom Bradshaw though. "It's a team game and Tom's very supportive of his team mates and he'll be the first to say they're doing him a lot of credit."